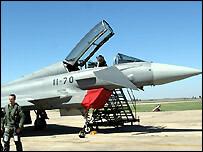 The first squadron of the RAF's new Eurofighter aircraft has begun active service at a base in Lincolnshire. 3 Squadron of the Typhoon Eurofighters based at RAF Coningsby is now fully operational and will gradually replace the Tornado F3. The aircraft, which can be scrambled within minutes, will play a key role in defending Britain's airspace. Wing Commander Lol Bennett of 3 Squadron said this was a key milestone for the RAF base. He said: "It's tremendous that we're here at a time when this key milestone is being met. "It's the first of many for us but it's a very important one because for many years people have said the aircraft is late... but now the aircraft is in operational service and it's being used on a daily basis to defend the UK." Defence Minister Lord Drayson added: "Typhoon is the RAF's newest and most capable aircraft, and is now providing a vital contribution to the security of the UK. "As Minister for Defence Equipment and Support I am very pleased that Typhoon gives the RAF the next generation of capability which will remain a world-leading aircraft as it continues to be developed and exploited." The £50m Typhoons measure about 52ft (16m), can reach Mach 2 speed and an altitude of 65,000ft (19.8km). The plane, which has taken 20 years to develop, has suffered from a number of delays and critics have said the technology and design is now out of date. Manufacturers also had to address claims the jet underperformed in early trials in 2004, particularly with regard to dogfight manoeuvrability - the MOD said those problems had been corrected. Britain has ordered 144 of the aircraft, 43 were delivered to RAF Coningsby at the end of June.